Every day’s a different one at the Voodoo DesignWorks. Though it’s cast in the role of a signmaker in Bristol, Voodoo attracts acrylic fabrication work from much further afield and it’s a far from usual diet that turns up at the door. Shop signs one day, large format printed graphics the next. Some days though you just can’t plan for. So it was when The Voice appeared in The ‘Works. 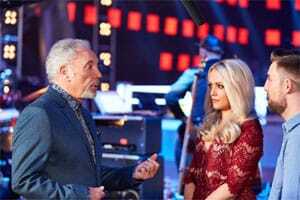 While most eyes watching The Voice on the TV will be on Tom Jones, Will I Am and and the talent the show attracts and promotes, various and sundry bits of Voodoo acrylic fabrication goodness are there supporting the spectacle and lending the show a big slice of its dazzle-factor. How do we do that? Voodoo does some pretty amazing things with the tools and acrylic fabrication materials it has at its disposal. For a start, we put those tools in the most talented bunch of designers and production specialists you’re ever likely to meet. That’s when the difference that is Voodoo happens. It doesn’t matter how far “out there” your ideas are, they won’t be met with blank looks when you bring them to Voodoo. So when we were told that a performer needed to be at one and the same time caged, haloed and lit, we took a look at the design and we found a way of making it happen. We fabricated an otherworldly structure of hoops and rods into which one Sophie May Williams was inserted. Our fabrication was theatrically lit and set up a really dazzling counterpoint to stage lasers beaming arrow straight from above. Sophie May began her set confined by her Voodoo chamber which then flew off unbidden as her set hit its stride. A really special moment for us and a great demonstration of what a bit of application expertise and creativity can do when Voodoo nudges the creative slider up to eleven. 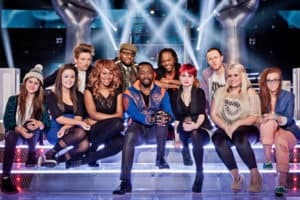 Those famous lit stairs on The Voice are down to Voodoo too. We fabricate acrylic constructions every day of the week but this one was a bit of a special. The tricksy lighting almost gives the impression that the fabricated set construction is suspended on nothing more than the theatrical lighting that it emits. We make the staircase the same way we’d make a fabricated sign. 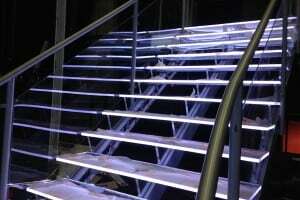 It comprises very accurately machined and polished acrylic fabrication elements and some smart, carefully concealed lighting. The light it emits comes, its seems from nowhere. The impact on the other hand, that’s straight at you. It’s a spectacular fabrication and it looks great every time we see it on this most popular TV show. 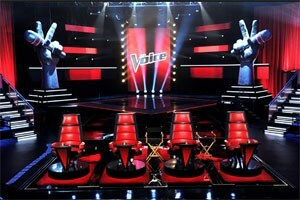 It’s not every day you get to make theatrical props for The Voice. It is every day that Voodoo gets to apply its talents to creative design and fabrication projects though. It’s because we know how to get things done and done well. If you’ve had to write an idea off because you just couldn’t get it done, get it out of your head and in The ‘Works. We’ll surprise you.